Sapi Gerumbungan is one of unique culture from North Bali, Buleleng. 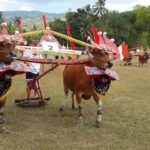 Sapi Gerumbungan is a culture that becomes an annual event in Buleleng that usually celebrate on Sunday of August in Kaliasem village, Lovina. Sapi Gerumbungan is also like a competition. The word “gerumbungan” means a big bell and the bell is hung on the cow’s neck. In this competition, not all types of cows can participate. Only a gallant bull. The selection of bulls is done by livestock groups with several criteria. They prepare young boys for the performance of Sapi Gerumbungan. 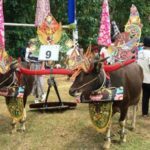 In Sapi Gerumbungan show, a pair of cows on their necks are connected with a wood called “uga”, in the middle of the uga lies a 3-meters wood where the jockey stands. Like Karapan Sapi / Makepung in Jembrana District. The cows are decorated, hung a big bell called Gerumbungan. Participants including jockeys and cows already trained, every jockey expects his champion to go fast and be a winner. 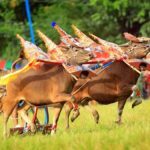 The unique culture and traditions of Sapi Gerumbungan become a routine activity, as an annual event that can also be a support for the attraction of Buleleng Regency as a tourist destination. 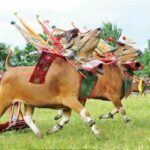 Another interesting thing is that tourists who want to feel the jockey can try to control this Sapi Gerumbungan with a guide. Do not worry, because cows have been trained and will not be rampage.